Finally, a way to use what nature provides to safely help strengthen thinning hair and remove the display of baldness! Unlike other items available on the market, this is no inefficient cover up, weak spray or poor quality cream. This product is based on advanced scientific principles producing a product that is nothing like anything else you’ve tried before. Toppik is an innovative composite of micro-fibre hairs made up of the same organic component that makes up our own fibres, keratin. These blend effortlessly on your scalp using an exclusive process unique to Toppik. The results are instant, with a full natural looking head of hair. Using Toppik is easy; simply hold your personalised container over your head at the area you wish to improve.Lightly shake and within moments, thousands of colour matched micro-fibres will instantly fall into place and bind using the forces of static electricity. This will ensure that no matter what you do or the weather you experience, the micro-fibres will stay firmly in place. Toppik is delivered to you in a stylish and specially constructed container set with 167 technologically enhanced openings, allowing for efficient dispersal of the micro-fibres. Everything has been invested into the design to ensure it is as discrete and as easy to use as possible, allowing you to use it anytime and anywhere, even without a mirror at hand. 30 seconds is all it takes for Toppik to take full effect, instantly transforming vellus life-less hairs into full thickness strands. Thanks to these minute hair building fibres, you will notice a direct and immediate renewal of your scalp. Most products on the market today are poor in truly delivering a great result, only providing you with an apparent improvement that disappears within moments. This is not what Toppik has been designed to deliver. The ability of Toppik to intertwine organic and natural keratin micro-fibres with your own hair means the results are real and palpable. This will even allow you to style your hair in ways you’d given up on years ago! Whatever the weather, the Toppik effect will last through it all. Because of the way it works, it will not never smear, stain or move in any way. Even as close as two inches away, and with a trained eye, it is impossible to distinguish Toppik hair fibres from your own. The merging of the two is so complete that it is indiscernible and looks incredibly natural. Furthermore, these results will remain until the next time you shampoo, giving you healthier, fuller looking hair for as long as you want. Toppik is also compatible with Minoxidil, and a brilliant product for women and men of all ages. Toppik is suitable for use as a non surgical solution and works impeccably to hide away any unsightly hairlines showing where hair loss had started from, as well as helping to bridge the gap whilst hair is recovering. 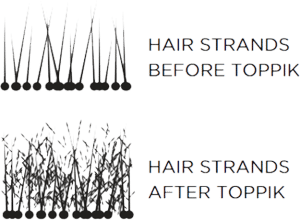 If you are not keen on a surgical method to help with thinning hair or hair loss, Toppik is the perfect product to use in the mean time, allowing you to see instant results. Regardless of your condition or the state of your hair, Toppik will help boost your confidence and ensure you love what you see in the mirror every time!